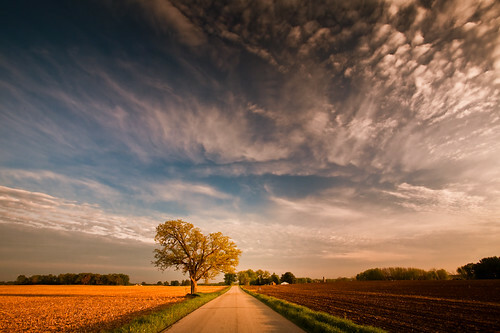 This entry was posted in Photos and tagged "Dane County", 2011, american, canon EF 17-40mm f/4L USM, canon EOS 5D, Clouds, cooksville, country, country road, countryside, dunkirk, Field, golden hour, highway, horizon, image, landscape, light, lone tree, loren zemlicka, may, Midwest, north america, oak tree, photo, photography, picture, road, Rural, shadow, Sky, Tree, usa, Wisconsin by lorenzemlicka. Bookmark the permalink. This reminds me of a Tim Burton’s film… the atmosphere is incredible! Tranquility comes to mind while looking at this shot. I very happy that I have discovered your blog. Your work is simply amazing!